This premium multi-zone speaker distribution system is is a highly efficient dual-source speaker controller and distributor that controls up to 5 speaker pairs. Users can easily control speaker pairs and amp/receiver sources from one central location through this controller box. Easy solution for enjoying multi-zone music in the house while protecting your amplifier or home AV receiver from damage and maximizing the performance of your music system. Built with 2 amplifier inputs, this 5-zone speaker controller allows users to program which amplifier input to be routed and which speaker pair to be used for output and music distribution. Its deluxe front panel design provides total of 6 volume controller for each of the 5 speaker output zones plus the headphone output so users can control all the volume levels for each room from one convenient location. This system is built with advanced protection circuitry to safeguard the amplifier/receiver connected and the remote speaker pairs against excessive power overload. This professional speaker distribution controller helps your existing receiver or amplifier expanded to handle more pairs of speakers. The system provides a convenient termination point for users organize a central speaker wire distribution point easily and neatly. Some speakers may be favored for going with particular amplifier or receiver. With the help from this speaker distribution system, your choice of speaker is only a push button away. This speaker controller system supports 2 inputs of amplifiers or audio receivers as the A/B source. 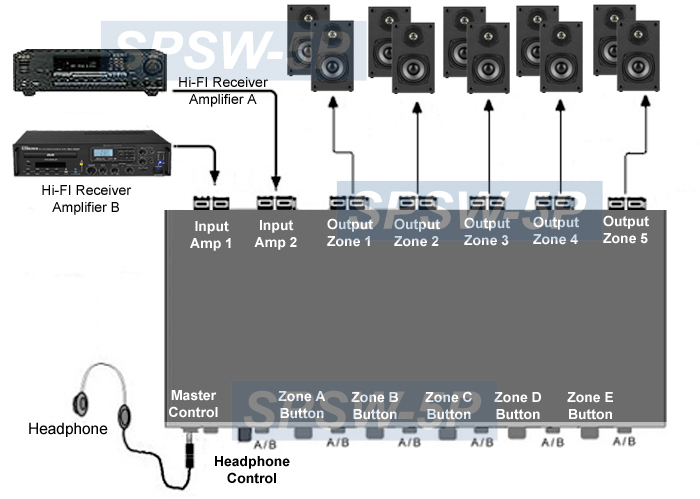 When both inputs are used, each speaker zone has individual choice of choosing between A and B amplifier or receiver as the input source for instant music play. 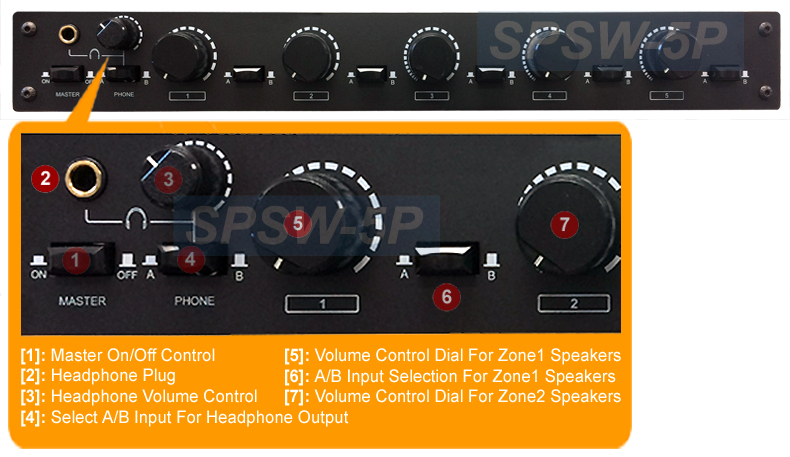 For example, users can select receiver/amp B to be played through speaker zone #1, #2 and #3 and speaker pair #4 and #5 are reserved for performance from receiver/amp A. The volume level for each speaker zone output can be individually controlled through front panel. Users can have central control on the volume outputs of all zones without adjusting from the source (amplifier or receiver). Individual volume control is also available for its headphone channel output. Protect the amplifier connected from power overload events. Protect the remote speaker pairs connected from excessive power wears. This multi-zone speaker distribution controller also provides a well-thought-out Master On/Off switch on the front panel for turning on or shutting off all speaker outputs instantly if such fast operation is needed in the application. This speaker controller also provides a stereo headphone port for private listening or volume/signal monitoring purpose. Individual headphone volume control and A/B input selection are also available. Premium multi-zone stereo speaker distribution controller to drive up to 5 pairs of speakers from 1 or 2 amplifiers/receivers. Users can easily control speaker pairs and amp/receiver sources from one central location through this system. Easy solution for expanding the speaker hookup capacity for the existing receiver or amplifier to handle more pairs of speakers. Professional audio distribution controller for 1 or 2 amplifiers/receivers distributing music to different rooms/zones. Each speaker zone output has individual A/B input source selector when 2 amplifiers/receivers used in the setup so users can easily choose input A or B for play and program the speaker zones needed for output. Independent volume control dial for each output zone and the headphone output. Playing audio on any selected speaker pair at different volume levels as desired. Maximize the performance and music power while protecting the amp/receiver and loud speakers connected through this speaker controller. Advanced protection circuit built in to ensure safe load to the amplifiers/receivers connected. One headphone port for private listening or volume/signal monitoring purpose. Individual headphone volume control and A/B input selection are also available. Supports a mixture of speaker pairs with impedance from 4 to 16 ohms. Master On/Off switch control for turning on or off all outputs instantly. Highly efficient transformer-based design with automatic amplifier impedance protection. Extremely low power loss in each zone when all five controls are set to maximum volume. Separate left/right ground paths for full compatibility with all amps, preamp, audio receivers, home theater systems. Convenient snap push terminals that accept up to 12 AWG speaker wire. 100W power handling per channel with 8 ohms speaker load. Deluxe well-shielded steel housing to match with existing home Hi-Fi style. Need speaker wire to RCA phono terminal adapters for your amp or receiver ? Click here to order them !